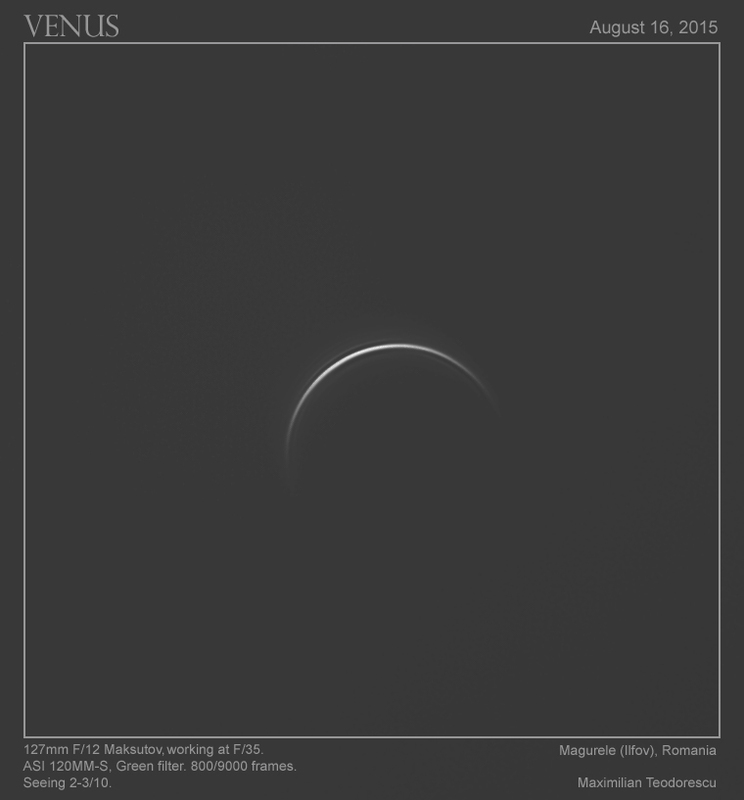 Just a few tens of hours ago, planet Venus was at inferior conjunction, meaning that the planet was between the Sun and the Earth. This means that the angular diameter of Venus was at it’s maximum, near 1 arc-minute, or around 1/30 from the apparent diameter of the Sun or Moon in our skies. This is usually very good for astro-photographers since the bigger the size of the object, the smaller details can be obtained onto it’s surface. The problem with Venus (and Mercury also) is that being closer to the Sun compared to Earth, at it’s largest apparent size the planet is only visible in the daytime. This also means that finding the planet is not as easy as looking for it at sunset/sunrise with your naked eyes and pointing the scope in that direction; in daytime you have to know the position of the planet in relation to the Sun (or if you have a GPS scope just press the GOTO function) and hope you don’t point it directly to our star…which will damage one of the sensors (either your CCD/CMOS camera, or…the eye!!!). 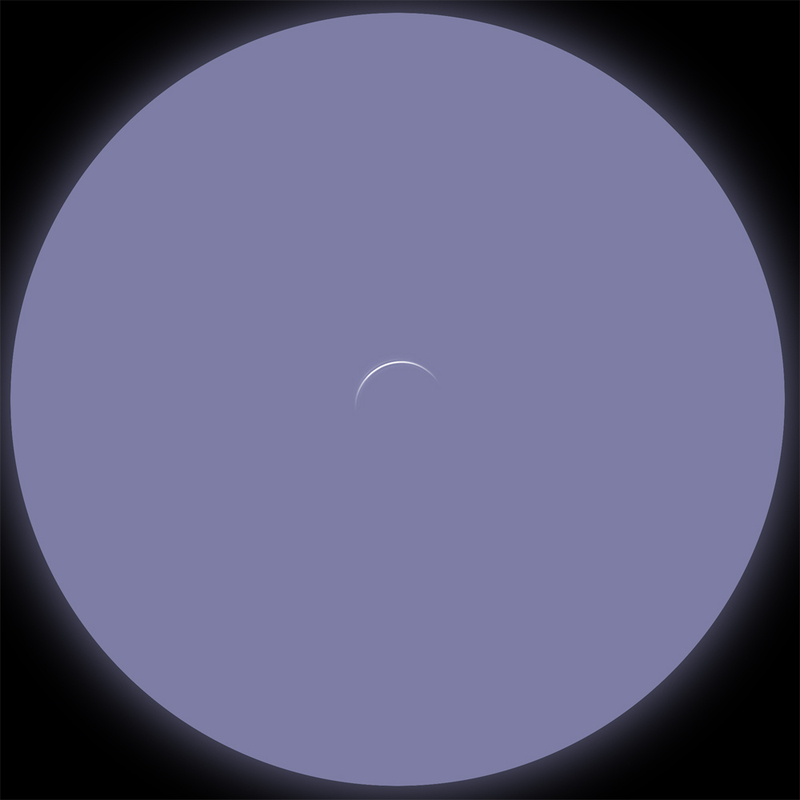 This was the feeling that I had today while trying to capture Venus in daytime. Pointing blindly the scope to the computed position and searching the planet through the eyepiece for about 10 seconds rewarded me with a superb view of the thin crescent. The following is an approximation of the view I had at the eyepiece at 250x through a 127mm Maksutov telescope, the image of the planet itself being the result of the session. 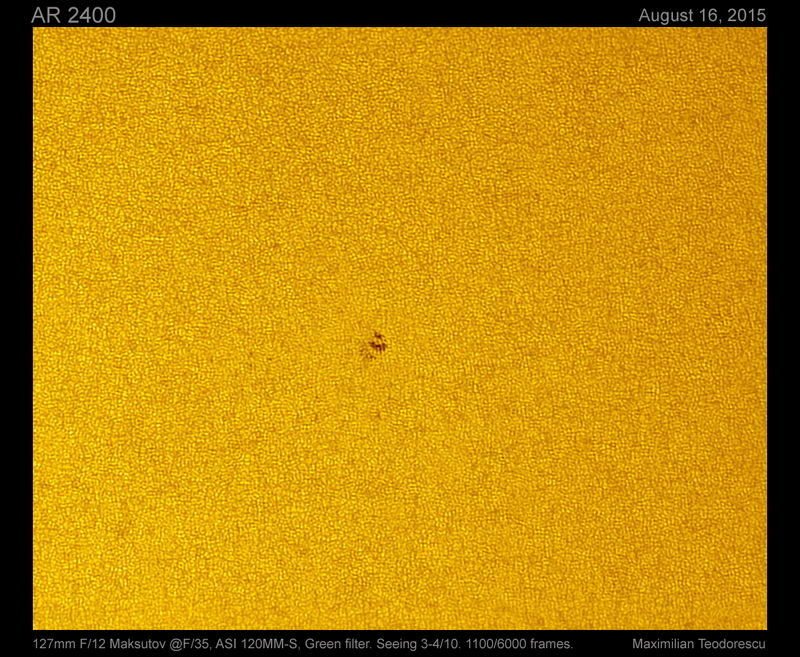 After finishing the Venus session, I’ve pointed the telescope towards the Sun (with a proper solar filter placed at the front) and imaged the two very small and apparently uninteresting sunspot groups. 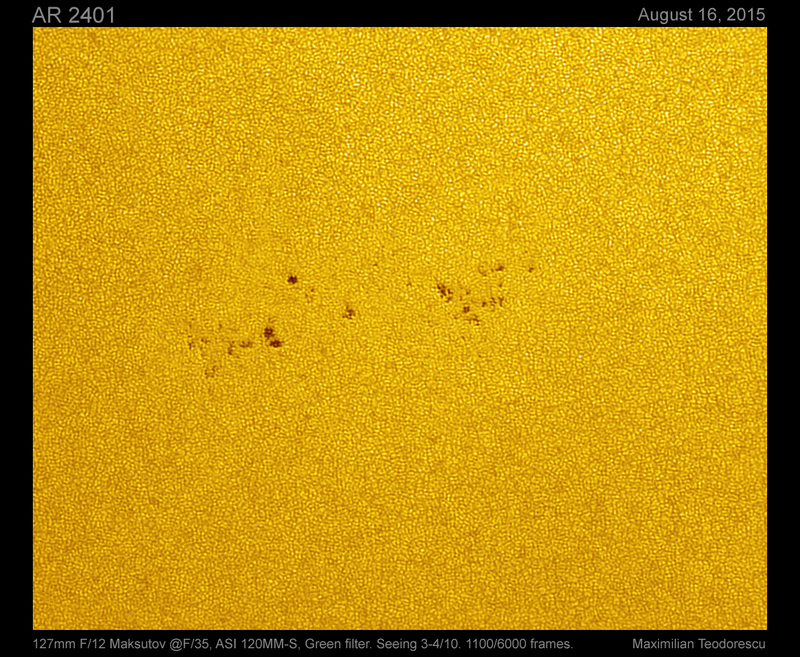 The granulation is discernible, but the seeing conditions, amplification factor and scope diameter didn’t allow for a clear view of the Sun’s surface. This entry was posted on August 16, 2015 at 20:53 and is filed under ASTRO. You can follow any responses to this entry through the RSS 2.0 feed. You can leave a response, or trackback from your own site.